These adorable primitive pumpkins will greet your guests and add some depth to any Fall scenery! It features a HAPPY HARVEST Sign and a CROW on top overlooking the garden! 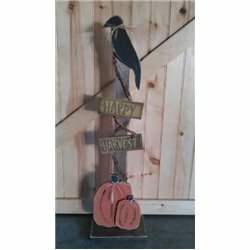 Add rustic charm to your home this holiday season with this handmade, primitive Pumpkin Welcome Sign. Perfect for your front yard, up your driveway or around your mailbox. Crafted by Pennsylvania Amish.